We’ve been providing quality family friendly entertainment to high school after proms, post parties, and after glows for over twenty years. One of our earliest after proms was for the Western Reserve Academy in Hudson, OH. and held inside of The Power House in Cleveland, Ohio. I can still recall my trepidation as we setup our Bungee Challenge, an inflated touch down football competition. As the vinyl slowly filled with air it looked as though it wasn’t going to fit. Fortunately, it did, if with only inches to spare. All of the kids had such a great time that that single job ended up starting one of our most valued business relationships that has lasted all of these long years. 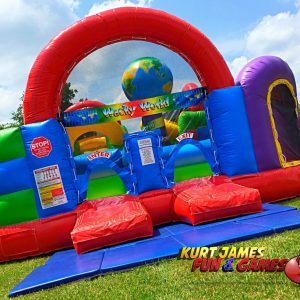 While we still have our Bungee Challenge (it doesn’t look 20 years old – take a closer look), we also have a variety of new and exciting inflatable and mechanical rides to offer prom post parties. One of the offerings about which we are most excited, something that we think will replace your garden variety casino night, is our new game show division, Fun and Game Show. That’s right, we now offer a full professional level game show experience that will keep everyone entertained and talking for weeks after. Tell your PTA, or PTO, to call us today. Dates are filling up fast and you don’t want to be left with the same old stuff when you can have the best.